Nomad Touchscreen Friendly Paintbrush Now Available | OhGizmo! I Want To Work In A Plexiglas Dome Too! A lot of users see the iPad’s large touchscreen as a blank canvas waiting to be filled, but for painters, using a finger or even a traditional stylus just doesn’t provide the same experience as a brush on canvas. So after grappling with those inferior options available to him, architect/artist/inventor Don Lee was inspired to create the Nomad Brush. 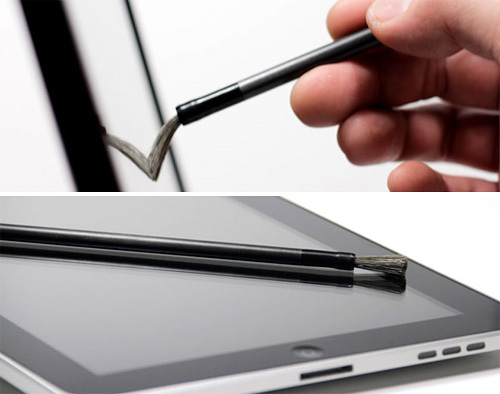 Instead of regular bristles made from something like sable hair, the Nomad uses a blend of natural and conductive fibers, allowing it to be detected by the iPad’s capacitive touchscreen. So while technically any device with a capacitive touch screen will work with the brush, at the moment the iPad/iPhone/iPod Touch are probably your best bets given the large collection of painting and sketching apps available in the iTunes App Store. At the moment the Nomad Brushes are all hand-made from the aforementioned natural and synthetic fibers with a carbon and walnut wood handle, and as a result will set you back $24 each. But they look like a piece of art in and of themselves, so as far as I’m concerned even at that price they’re a steal.